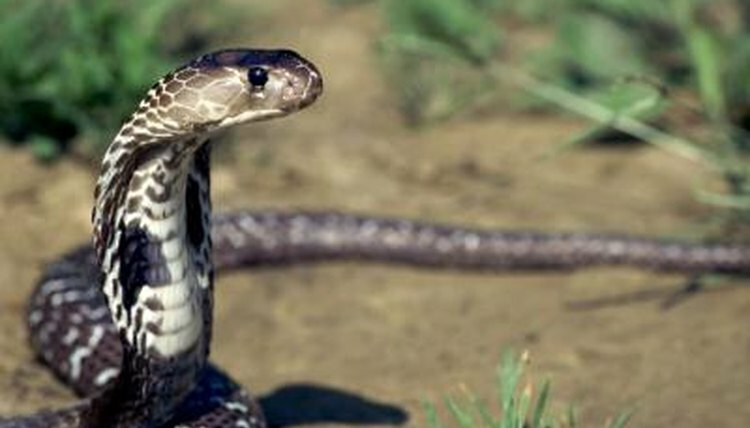 Few snakes have a history as rich as that of cobras. These snakes have been depicted in art and literature throughout history. In spite of, or perhaps because of, their highly venomous nature, cobras are important to the culture and belief systems of Egypt, India, and many other parts of Africa and Asia. Their mystique has not faded with time, and cobras can be still seen rising out of the baskets of snake charmers throughout that part of the world today. True cobras belong to the genus Naja. Although all cobras are able to spread the ribs in their neck to stretch their skin into a hood, not all snakes with this ability are cobras, including the king cobra, which actually belongs to the genus Ophiophagus. There currently are 28 known species of true cobras spread across Africa and much of Asia. Probably the best known cobra in history is the one that the Egyptian queen Cleopatra allegedly used to commit suicide. Although Shakespeare identified this snake as an asp, historians believe he took poetic license and that the most likely culprit, if indeed Cleopatra did commit suicide by snake, would have been an Egyptian cobra. However, more recent research has historians questioning whether a snake was involved at all, and now believe it’s far more likely that Cleopatra ingested a suicide cocktail made of opium, hemlock and aconitum. The cobra has been an important religious icon in the Egyptian pantheon and Hinduism. In Egypt, the fertility goddess Renenutet and the nature goddess Wadjet often were depicted as cobras. The symbol often used for Wadjet, the Uraeus, was an upright hooded cobra that came to symbolize royalty and deity, and was often affixed to the headdresses of Egyptian royalty. The cobra also is an important symbol in the Hindu and Buddhist religions. The Hindu god Shiva usually is depicted with a cobra around his neck as he meditates, while the god Vishnu is shown to rest on the back of a cosmic cobra named Ananta as he dreams the universe into being. In Buddhism, Buddha sometimes is shown being sheltered by a five-headed cobra. Snake charming is an ancient practice that still is done today in places, such as India, Singapore and North Africa. Snake charmers play flute music that appears to hypnotize snakes -- usually cobras -- and make them “dance.” This form of street performance dates back centuries, and is believed to have gotten its start in Africa and India. Today, snake charmers still rely on this trade to make their living, but they have come under fire for what some believe to be inhumane practices, such as using twine to stitch the cobra's mouth shut to prevent it from biting. Not all snake charmers do this; nevertheless, in some places modern snake charmers face bans on ownership of snakes, and other laws designed to prevent exploitation and cruelty. Why Do Lizards Fall Asleep When You Put Them on Their Back? Are There Snakes in Cortona? What Are the Top 10 Most Famous Lizards?